Recently I had the pleasure of speaking with Sydney Olson, a 21 year old college student who has had alopecia areata for over 10 years . Sydney is currently a biology major and chemistry minor at Concordia University in Nebraska. She was kind enough to share her story and many tips from her experiences with the condition. Those tips include opening up about AA to your family and friends, understanding how those around you cope, and how to be confident as a young woman with severe hair loss. "I would say just be you. Don't change your personality and what you hold to be true to you. 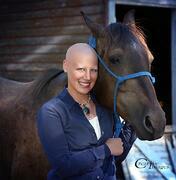 You can't change who you are if you are to be able to cope with losing your hair." Read more to enjoy our full interview with Sydney, posing here with Arya. Thea: Had you ever heard of alopecia areata before you got the diagnosis? Do you remember what you were thinking when your hair started to change? Sydney: I hadn’t heard of it before I got diagnosed at 10 years old. I remember being scared, confused, and angry when my hair first started to fall out and every time since then. The second time it fell out was June of 2012. I was 18 and had just graduated high school. I kind of panicked a little bit when it started to fall out again, because I knew what it was but I didn’t know what had triggered it. It started to fall out in patches. By October 2013 I had no hair. I had lost my eyelashes overnight and my eyebrows, they just suddenly weren’t there one week. Thea: There was a lot going on that last round! I'm curious...who noticed it first? Sydney: I noticed it first and then my mom noticed I was pinning my hair up more and wearing hats. I was very forthright with my parents because I didn’t know how to handle it at the time. None of my friends knew until I started college in the fall and all of us were at different colleges. Thea: How did your friends react? Sydney: My friends were very concerned and upset and confused when they found out. They still accepted me for who I was but it was hard on them watching me be angry and confused and becoming more “hermit” like. They were trying to be as supportive as anyone could be. Thea: What helped you tell people without getting into a long conversation (unless you wanted to go into depth about it)? Sydney: I just informed people if they were staring or asked me about it. I told them my immune system attacks my hair follicles and there’s not much I can do about it. I told them it was not cancer and I was perfectly healthy and fine otherwise. It took me quite awhile to get to that point in explaining myself to others. My professors were asking me what’s up and that started the whole thing of me explaining to people I was okay and what alopecia was. Thea: What tips do you have for other young women going through the same thing? However you handled it, would you do it the same way again? Sydney: I would say just be you. Don’t change your personality and what you hold to be true to you. You can’t change who you are if you are going to be able to cope with losing your hair. Plus having no hair means it’s a lot easier to get ready. It’s never easy and people are shallow. I don’t think there was a right way to handle the situation. I think next time around if I do get my hair back and it falls out again, I will just shave my head and not make myself go through the psychological stress and trauma again. I don’t think I will ever go through the different treatments to get my hair back again. I wouldn’t try wigs again. I would definitely stick to my hats, “Buffs”, and my headed sweatshirts, and embracing the baldness again. Thea: Have you and your mom coped with the diagnosis in the same way? Sydney: I don’t think we’ve coped the same way. I coped by focusing on school and running 10-15 miles a week, to relieve some anxiety and stress. I also avoided people unless I had to be somewhere and interact. I had to be around people I knew, was comfortable with, and trusted. Mom was the one who researched everything. She was the one who pushed trying wigs and different treatments to make everything better. She couldn’t accept that there was nothing to make it better. I had to come to terms with it in my own given time, which wasn’t what she wanted. She pushed me to accept things faster which was good and bad at the same time. No one allowed me to be too depressed and down on myself, which made me kind of upset because I needed that “grieving” period. We don’t always attack things the same way. I go for the more direct, scientific, pro/con approach. 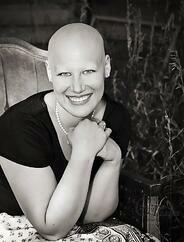 Thea: Do you have specific concerns because of your alopecia that you didn’t have on your radar before? Sydney: I was concerned about the hereditary details of it and if I so chose to have children if they’d get it or be prone to different genetic anomalies. Thea: Has your beauty routine, clothing or accessories changed? Sydney: Yes, to an extent it has. I wear bigger necklaces, and am not so shy with my jewelry. I wear more hats and scarves. I also tend to wear more dresses and skirts to make me feel girlier. I also had to figure out a new make up routine because I had no eyelashes anymore, which is what I always did up. I had to find new make up and techniques to make it look like I could define my eyes again and to make it so the make up didn’t burn my eyes if it ran into my eyes. Thea: Did you have any ah-ha moments that got you on the path to coping/acceptance? What sparked it? Sydney: I had an ah-ha moment when my boyfriend of almost a year left me, and when a wig lady told me I couldn’t be a lady without hair. I had some personal vendettas to fulfill and make the world know that I was still me and I was going to be okay. I found out people are shallow and couldn’t cope with me being different; and I needed to make myself cope so everyone else would. If I was confident and made it no big deal then so did most everyone else. Thea: What types of resources have been the most helpful? least helpful? Sydney: I think having people share their thoughts and stories have been helpful. It’s definitely helpful when there’s an article about the science behind alopecia, and everything there is to know about. I think write ups about fad new medications and drugs aren't very helpful and people making hair sound like it’s no big dea is not helpful either. Thank you Syndey for lots of coping tips that work! Share your comments with Sydney in the section below.